My creative rumblings: Feeling ready for Spring! I used Dylusions in Red, Orange and Green. The stencil pattern was cut on the Cameo (using Make the Cut). I used a Freebie SVG as a pattern for the stencil offered by Birds Cards. The background image is SU and the rest are by About Art Accents. The image is colored with Copic Markers in colors to coordinate with the background. The leaves are a separate image, so I masked them. The shimmer I added with a Stardust Gelly Roll Pen. Thank you for describing the technique. Very nice. Thank you for joining us at Get Inky this week. 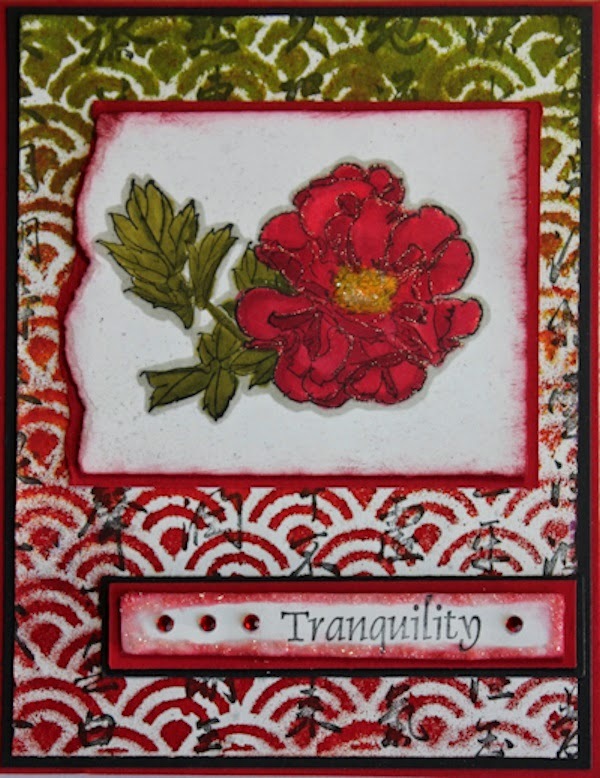 Love the way you have used the colours on the background Shelly - a gorgeous card. You're rocking that Cameo now!! So very pretty and love that beautiful flower. Wow, Shelly, this is so beautiful. Love the dramatic colors, so rich and deep. The textures enhance the richness as well. Very pretty indeed! Very pretty results. Lovely colours. Very pretty, such a lot of work ... love the stencil you made. Thank you for joining TTCRD this week. The background is so rich in colour - a gorgeous card. Beautiful! I love the flower image and how you've colored it. And the sentiment is perfect! Wow, Shelly, It is absolutely gorgeous! I love the rich colors. I like your BG, your main image, and your sentiment!! I like the whole card!!! Shelly, this is so pretty. Love the word - TRANQUILITY! Nice thought! So beautiful, Shelly. The colors are so rich and elegant looking. How pretty Shelly, the spritzing through the stencil makes a wonderful background! Thanks for playing along with the Bloggers Challenge.